Well it is actually Autumn here in Perth, but so much of what is going on around here feels like spring. The little chicks and bunnies surrounding us as vestiges of Easter. There’s the refreshing rains, the cool mornings but warm afternoons and the lovely Easter and Anzac Day holidays. The fact that we’ve just moved into a new house and I’m doing a lot of spring cleaning of things that have been in storage for around six months. Every year I spend in the scrapbooking community with all my northern hemisphere buddies, I have to remind myself we are moving into winter at this time of year, as all my online friends are enjoying springtime! We all need some help with Mother’s Day Cards, birthday cards and of course in our case moving announcements! I should probably also think about some thank you cards for all those who painted and helped us move. Which season do your enjoy best? Is it spring or autumn in your area of the world? PS. If you have a blog you can sign up for a chance at 50 free cards from Shutterfly too! 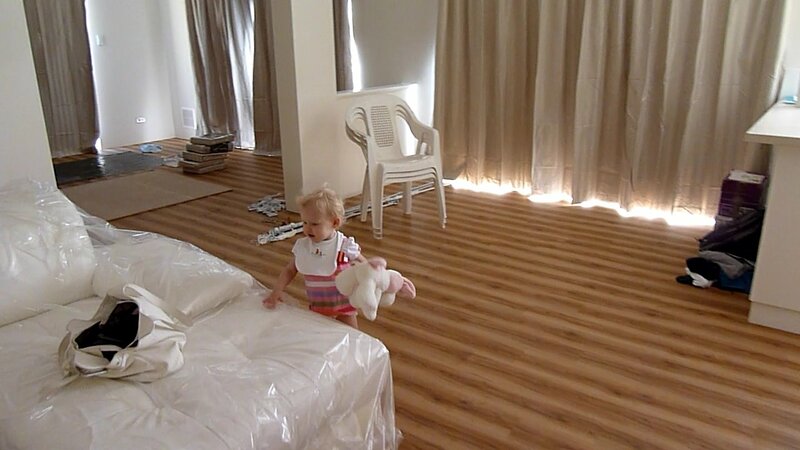 Emily inspecting the new lounge suite. Yes, Phill and I finally both liked the same one – and once I got over the fact it’s leather and very pale cream, I’m loving it and the adjustable head rests! After about two weeks without uploading my Nike+ I made it to green level with 15kms uploaded on one day! Emily fast asleep in her “new bed” we had the new sheets but the bed came out of storage a few days later. Who else wants to take a free class at Big Picture? Almost a year ago I got an email from Stacy Julian asking if she could schedule a conference call for herself, her partner Kayce, and me to discuss some things. I was blown away when we had the call and they said they wanted to partner with The Daily Digi to bring digital scrapbooking classes to both of our customers. I am excited to announce that today, the first few digi scrapbook classesare live! We have a couple of free classes and something for every level of digi scrapper. Now, when you click on the “Classes” link in our header, you will land on our co-branded Big Picture Classes/The Daily Digi page. Be sure to check back often to see what’s new and sign up for our newsletter so you don’t miss a thing! We have lots of great classes and workshops being created right now and we can’t wait to share them with you! How cool is that! I’m keen to check out Jenn Lindsay’s class on using blends. Have you taken any classes lately? Link me up in the comments. I just had to pop in and share this cool little freebie from Sir Scrapalot, one of my favourite digital scrapbooking bloggers. Each year I love making Mother’s day cards and as I was browsing for inspiration I found this special offer to share with you! Tiny Prints has you covered this year for Mothers’ Day with their Tiny Prints Greeting Card Collection, which lets you create individual personalized cards with photos starting at $1.99. They have cards for everyone in your life from your mom, to your grandmother, sister, daughter or anyone else important to you. In a matter of seconds, you can create personalized Mother’s Day Cards and have Tiny Prints mail them directly to you or the recipient. No more scouring the racks at your local convenience store for a lame last minute card, Tiny Prints has removed the hassle and added the fun back into Mother’s Day shopping with a personal touch. As an extra bonus, You can also sign up for a Free Greeting Card Membership, giving you three FREE greeting cards to use right away, as well as discounts on future cards. Offer ends 19th April 2011. Sounds like a great deal to me! In the past I’ve printed cards at home on our colour laser printer, but we are in the process of moving and sold our printer – so this is a good option for us. Do you use custom printing services? Over the past few years I’ve made photo thankyou cards with Vistaprint when Emily was born, printed Christmas cards with Snapfish Australia (2008) and Shutterfly (2010) and printed photobooks with MyPicTales, Shutterfly and Snapfish Australia. I’ve been happy with the customer service I’ve received from all of my orders so far, and have heard a lot of good things about Persnickety Prints and Photobooks by Tiny Prints. also. Who is your favourite printer? 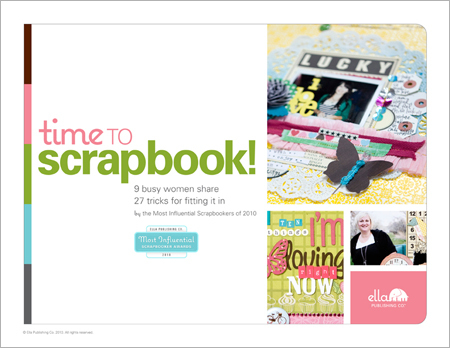 Thanks to Kim Byrns from Bite-sized Scrapbooking, I’ve won an Ella e-book! Now I just need to decide which one to buy! Maybe this one? Time to Scrapbook! Have you bought a great e-book from Ella – let me know which one you loved! I’m looking to invest my winnings wisely. If you haven't yet - why not head over and pick up their Free Super Sampler. Did you know that Ella Publishing Co. is doing Spring Training. 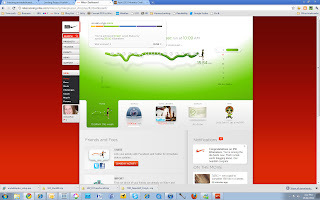 It looks like a fun online event to inspire you! I’ve just put together a few photos of my album so far. I’ve been working on my One Little Word album – here’s my progress so far. I am having so much fun doing ‘real’ paper scrapbooking, I’ve been inspired to make a few cards! I’ve been printing most things at actual size and then reshuffling the items to fit in my mini album. For the embellishing, I’ve been keeping my album simple - I’ve been using Basic grey porcelain rubons and a couple of random flowers and brads I’ve found for this album. My little album is 7.5”x5” and created using my Bind-it-all – but for the time being I’ve just got two jump rings holding it together while I work on it. Ali sends out monthly emails with a prompt for the month, and I’m working on my April one now. Did you know that the One Little Word class is still open? You still have plenty of time to catch up or why not just jump in with this month’s prompt? I am blogging about my progress in the classes I’m working on over at Big Picture. Are you taking any classes at the moment or perhaps you are playing along with Katie and creating your own curriculum? I just have to share the news – my friend Katie has a new workshop over at Big Picture Classes. Here’s a little about it from her blog. Registration open for Power Scrapping–Digi Style! I can’t even begin to tell you how excited I am about this! 4 weeks of detailed instruction all about Power Scrapping – Digi Style, with video lessons, printable pdfs, bonus idea sheets, bonus downloadable templates, and some free gifts and coupons from some of the top designers in digi land! All for only $25. Really! Head on over to Big Picture Classes to sign up. I’d love to know if you’ll be joining me for this fun workshop, so feel free to leave me a comment if you are planning on taking it. I just know you will love it! I just happen to have a few dollars left on a gift-card I got for Christmas so I’ve already signed up! Do you want to register too? If you decide to register at Big Picture using my link and purchase Katie’s class (or any of the others! ), we'll both receive a code for 10% off** our next order. Of course you can always just sign up and select from one of the free classes. I am blogging about my progress in the classes I’m working on over at Big Picture. So stay tuned people! PS more about my One Little Word album soon! Only about two months ago (how time flies!?!) Phill brought us a back a couple of souvenirs From Argentina and Chile. Mine was a small, tooled-leather box from Mendoza, a city nearby to the Gold mine. I also got an alpaca wool scarf, in PINK of course. Emily’s gifts were a giraffe puzzle with a baby giraffe (cute!) and her ‘Argentina hat’ – a bright pink beanie with an alpaca and other animals and things stitched on it! Emily’s had a hard time working out that Daddy isn’t going away every time he leaves for work. She stopped asking to see Daddy on ‘puter (Skype) a couple of weeks ago. This morning for the first time since Phill has been away she told me “Daddy, gone! Work, big bus” rather than “Daddy, gone! ‘Tina!” Such a relief that she’s finally getting her head around the fact that Daddy is back to stay. Learn more about the New 52 challenge here. I’m finding that looking out for new experiences is helping me appreciate that my life is full of variety. What new things have you tried this week? I did it! I actually read the Bible in 90 Days! I completed it on the 1st of April, Day 89 of the reading plan. I found Chronicles and Psalms hard going but surprisingly enjoyed the prophets. I also found the Gospels hard going, I think I just don’t enjoy so much repitition in a short space of time. But I love John, it just seems so much more specific with the little things that Jesus said in a more natural way, well that’s how it seems to me. I also noted all the bickering amongst the Disciples, well I guess they were only human! Reading the Bible in it’s entirity in such a short period of time really helped me follow get more of the historical facts in order and also made me realise that the New Testament is a lot shorter than the Old Testament. I mean, I knew it was, but it just became even clearer that a few thousand years versus less than 100 years of writing is a big difference. I am still enjoying the New 52 challenge too, what has amaze me as I’ve done this challenge is that I actually do so many new things I just don’t have time to blog them all! What new things have you done lately?